Below is an excerpt from my new book, The Apostles’ Creed: Discovering Authentic Christianity in an Age of Counterfeits. How do we even begin to speak of God, and by what right can we call him our Father? The audacity of claiming to speak of God seems massive enough, but then we go on to dare to call the almighty God our Father? This is exactly what Christians do and are taught by Jesus to do. Jesus taught his disciples to pray, “Our Father who is in heaven” (Matt. 6:9 NASB). Modern theologians have had a big problem with the God of the Bible. When I was a freshly minted seminary student, I was assigned a book by Harvard University theologian Gordon Kaufman entitled God the Problem. Kaufman wrote his book just a few years after Time magazine had scandalized the nation with its cover story from April 8, 1966, “Is God Dead?” The cover story reported that many academic theologians and liberal professors no longer believed in God. Kaufman argued that modern theologians needed to invent an entirely new language for speaking about God. The language found in the Bible, he believed, was out-of-date and unworthy of modern thinkers. Kaufman went on to argue that theologians must find a new way to argue that the word God is still meaningful. The God who existed in older theology no longer exists, and so existing theologians, he argued, must find a new way of speaking of God as real. But Kaufman was uncomfortable with speaking of God as real in any sense. His book was, in the end, a kind of argument for employing theologians at schools like Harvard University when their theologians no longer believed in God. A few days into class, an anonymous student drew a satirical cartoon on the class chalkboard of a book entitled Gordon Kaufman the Problem by God. The whole class got the point immediately. If there is a theological problem, it is not God. The problem is us. Contrary to Kaufman and the “God is dead” theologians, we do know how to speak about God, and we do know who God is. The reason we know these things is because God has spoken. God has revealed himself in both nature and Scripture, and what separates modern theology from biblical Christianity is the modern lack of respect for Scripture and for the authority of God. Instead of relying on God’s self-revelation in Scripture, so many modern theologies choose speculation and conjecture as their theological method. Much of this filters down into a form of postmodern pop spirituality, which has little to do with historic Christianity and biblical teaching. 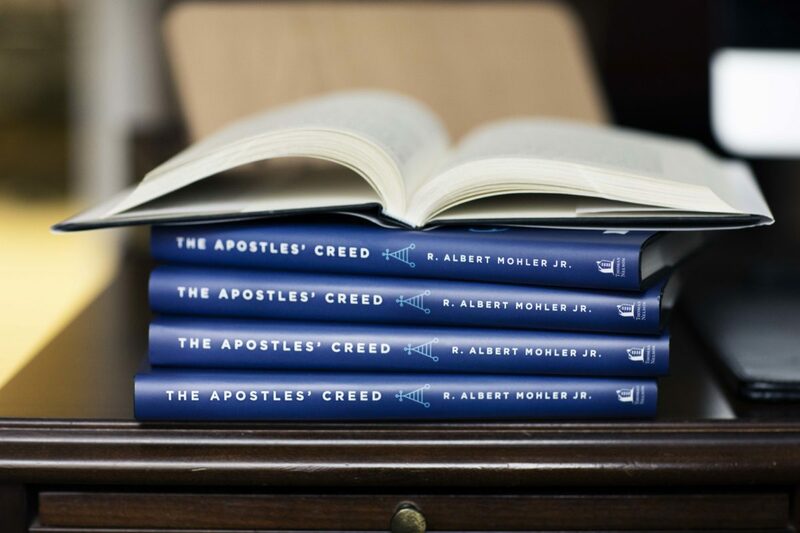 The Apostles’ Creed does not merely affirm, “I believe in God the Father,” but it adds, “I believe in God, the Father Almighty.” Just as God is personal, he is also all-powerful. God is immanent, but he is also transcendent. As Scripture indicates, God is El Shaddai, the God who is all-powerful (Gen. 17:1 CEV). This affirmation of God’s absolute sovereignty drives all that follows in the creed. God is the one who is all-powerful, all-knowing, and ruling creation. Even king Nebuchadnezzar confessed, “He does according to his will among the host of heaven and among the inhabitants of the earth; and none can stay his hand or say to him, ‘What have you done?’” (Dan. 4:35). In the Apostles’ Creed the word Almighty is a collective that is meant to represent all God’s attributes, the fullness of God’s perfections. All God’s attributes—omnipotence, omniscience, omnipresence, self-existence, and immutability—are summed up in this one word, Almighty. Only the God who possesses the fullness of perfection and infinite majesty can truly be almighty and sovereign over creation. Regrettably, the “God, the Father Almighty” affirmed in the creed is rarely discussed in many churches. Shallow descriptions of God and sloganeering are substituted for Christianity’s rich confessional heritage. Regrettably, many pulpits proclaim a truncated and distorted vision of God. Many preachers fail to open up Scripture’s rich teaching on God’s holiness, righteousness, glory, and majesty and merely proclaim “just an ordinary god.” The God of Christianity is not just an ordinary god. He is the Father Almighty; the Father who can do anything; the Father who possesses all power, the one who created by the power of his word and who rules forever. God the Father Almighty is the God we worship in song, deeds, and in the preaching of God’s Word. All hymns must reflect and resound to this glorious King. All preaching must fit his glorious reign. All works of service and love must be rendered for the glory of his name. This affirmation of God as “Father Almighty” ought to rule our hymnody, our teaching, and every moment of our daily lives. To read more, purchase your copy of The Apostles’ Creed at Amazon.com.